10 August 2016, 12:00 AM. Oh, my, look at the time – it’s time for another You Should Read This. 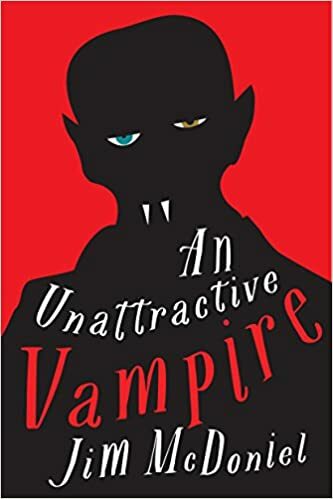 This time, the book is Jim McDoniel’s An Unattractive Vampire. Jim McDoniel’s debut novel, An Unattractive Vampire, is a darkly comic urban fantasy of ancient horrors in suburban cities. After three centuries trapped underground, thousand-year-old Yulric Bile—also known as the Curséd One, the Devil’s Apprentice, He Who Worships the Slumbering Horrors—awakens only to find that no one believes he is a vampire. Apparently he’s just too ugly—modern vampires, he soon discovers, are pretty, weak, and, most disturbing of all, good. Determined to reestablish his bloodstained reign, Yulric sets out to correct this disgusting turn of events or, at the very least, murder the person responsible. With the help of pert vampire-wannabe Amanda; Simon, the eight-year-old reincarnation of his greatest foe; and a cadre of ancient and ugly horrors, Yulric prepares to battle the glamorous undead. But who will win the right to determine, once and for all, what it truly means to be a vampire? Okay, so I mentioned this book during the City of Ashes sporking as a good example of a work that explores a variety of different takes on vampire lore, from across both time and space. The vampires in this book aren’t just your typical brooding fashion-models that drink blood that are favored by modern works (though those are in here). The “cadre of ancient and ugly horrors” mentioned above include vampire analogues from China, the Middle East, sub-Saharan Africa, and Latin America. But there’s more to recommend this book than just the wide variety of vampires – the book is also hilarious. I’m not going to get too spoilery here, but despite his issues, Yulric becomes a fan of the vampire TV show that inspired his little crusade. About mid-way through the book, the actors and writers of the show (who are all vampires, natch) attack the house he’s living in. During this attack, Amanda goes after one of the writers, not to defend herself, but because he ruined her ship. Then, when little-brother Simon manages to kill one of the actors, both Yulric and Amanda freak out because – I kid you not – now that character’s plot line will never be resolved. And honestly, if that doesn’t convince you to pick up a copy of this book, nothing will. I’m a bit conflicted on this kind of fiction. On the one hand, I’ve seen a ton of vampire spoofs over the past few years. On the other hand, most of them…haven’t been very good. From what you’ve said, though, this book sounds like this book could be a breath of fresh air. I totally understand your hesitance. So here’s what I recommend: follow the Amazon link, and check out the preview. You can read the better part of the first three chapters for free, and judge for yourself. You have posted about Jim McDoniel’s novel. I must say you have used simple words to write this post which i like reading. Keep posting more similar content.